Pickleball is one of the fastest-growing sports in the United States and an excellent game for families, no matter if the players are old or young – or somewhere in between! One of the best things about it is that it’s easy to start playing and you don’t need much to begin; just a paddle and ball, plus a sturdy pair of shoes. It’s easy to overlook the shoes as an important piece of equipment, but getting on the court with your regular old pair of tennis shoes can increase your risk of injury since they’re not designed for the type of quick, lateral movements involved in pickleball. But don’t you worry, we’ve done all the research for you to help you pick out the best pickleball shoes for you to improve your play and keep your feet and ankles safe and sound. 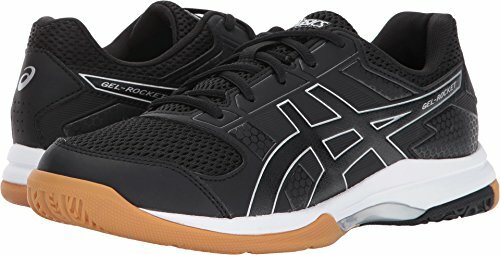 ASICS shoes are the most popular choice for women’s indoor pickleball shoes, a sentiment you’ll find echoed all over the internet by pickleball aficionados, as well as in the reviews section on Amazon. These shoes are popular for their Trusstic System tech, which keeps them lightweight without compromising the sole’s integrity. The gum rubber outsole provides excellent traction on court floors, with an extended side edge to prevent rolling and ankle injuries. They also feature a Forefoot Gel Cushioning System to reduce shock when you move, helping to protect your joints no matter how enthusiastically you play. The Trusstic System and Forefoot Gel Cushioning System are ASICS originals and you won’t find them in any other brand. They’re a comfortable, versatile, and stable option that won’t break the bank. ASICS describes them as a “top level shoe for an entry level price”, and they’re right! Plus, these shoes have non-marking soles, making them perfect for indoor play. Lightweight design helps to reduce fatigue during long play sessions and encourage quick movement. Unique Trusstic System balances its lightweight build with the stability of the sole. Forefoot Gel Cushioning System protects joints from high-impact activities. Wide-edge soles prevent rolled ankles. If you’re an outdoor player, these are the shoes for you. They’re designed for comfort and performance on the tennis court, which translates perfectly to pickleball’s similar performance needs. These shoes are lightweight, although slightly heavier than the ASICS Gel-Rocket 8. 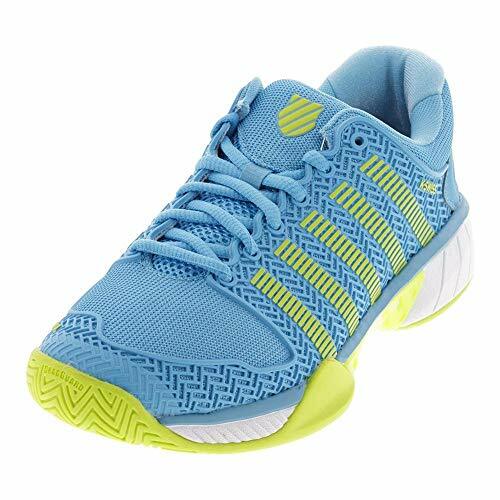 They’ve got the tightly-padded feel of a running shoe with high-tech design to improve your tennis game. The lightweight, synthetic leather upper is designed with Seamfree technology, so the layers of TPU are bonded to the breathable tech mesh without any need for stitching through a unique and state-of-the-art heat welding process. The ankle collar is well padded for increased stability and comfort and the padding extends to the tongue so you can tie your shoes tightly without discomfort. A die-cut Ortholite sock liner is present to keep your feet cushioned and comfortable. The sole is designed with K-Swiss’ signature Aösta II high-density rubber to diffuse the shock of impact as you play, without wearing out quickly, and features a herringbone tread that helps keep you grounded and stable as you tear up the court. One thing to keep in mind with this shoe is that it tends to run wide. For women with wider feet, these are a perfect option. If you have narrow feet, your best bet is to see if you can scope out a pair at a nearby retailer to make sure that you get the right size. Super durable exterior and sole will keep you shod for seasons to come. High-tech seamless upper design won’t rip or come apart. Extra padding around ankles and on tongue keeps the fit tight and comfortable. Molded sock-liner for additional comfort and support. Great for players with wider feet. 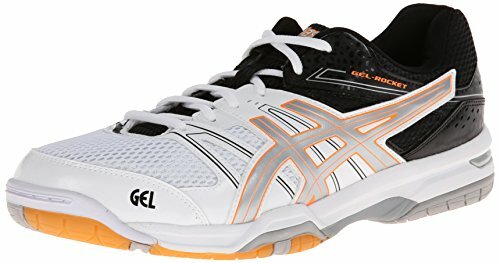 Much like their women’s counterpart, the ASICS Men’s Gel-Rocket 8 Volleyball Shoe is the best option for all the indoor pickleballers out there. Because they’re designed specifically for play on indoor courts – the similarity in movement needs between volleyball players and pickleball players is enough that it’s alright that these shoes aren’t pickleball specific – you can rest assured that they’ve got a tight grip to keep you from losing your footing on well-lacquered flooring along with soles are non-marking. Like the other ASICS shoes, these feature their patented Trusstic System, which fuses a lightweight internal design with structural integrity and durability, as well as the Forefoot Gel Cushioning System which helps protect your joints from shock by dispersing it through the gel. The gum rubber outsole gives you increased traction, even on the smoothest floors, and has a wide bottom edge to help prevent rolled ankles and other injuries. Also, like its lady’s counterpart, this shoe comes with an affordable price tag that’s a steal considering how high-performing, comfortable, and durable these shoes are. They’re also available in a stylish array of colors so you can choose what fits you best. Unique Trusstic System balances its light weight with sole stability. 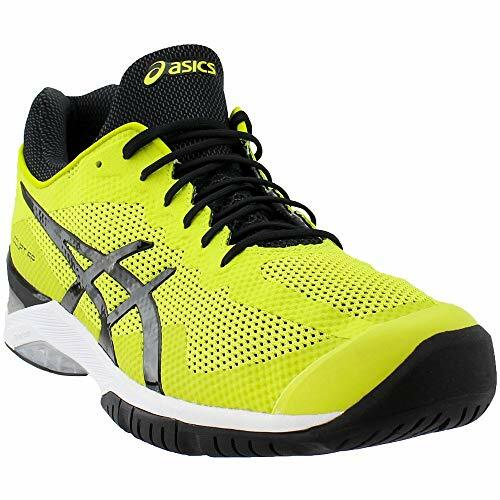 ASICS comes up repeatedly on any list detailing the best pickleball shoes on the market, because of their high quality and high-tech designs. The ASICS Gel-Court FF Tennis Shoe takes the cake for the best outdoor shoe for men. Much like the ASICS Gel-Rocket, we reviewed above, these shoes also feature Trusstic System technology to keep the shoe super lightweight without compromising structural integrity. They also have Forefoot and Rearfoot Gel cushioning to distribute and disperse shock as you move. The sole is made with ASICS High-Abrasion Rubber Plus, which is incredibly durable and long lasting. Instead of having a traditional tongue, this shoe features a MONO-SOCK Fit System with an elastic internal sleeve that allows the shoe to have a tight sock-like fit. It takes a little bit of getting used to and can be a struggle to get on the first couple of times, but once you’re used to it, you’ll never want to go back to boring old traditional-tongued shoes. Plus, the upper has a seamless design for durability and to reduce discomfort from rubbing seams. One of the best factors in this shoe though is its Flytefoam midsole technology, which uses organic super fibers to provide some really powerful responsiveness and bounce-back (without degrading over time). It’s a unique piece of shoe technology and gets glowing reviews from its users, including long-term and respected members of the global pickleball community. The only downside to this option is its price. The main benefit you’re getting from these shoes is its inclusion of the revolutionary Flytefoam technology. If the price spooks you, you can get a similar shoe in the ASICS Gel-Resolution 6 or 7. The main difference between these shoes is the lack of a MONO-SOCK design and the Flytefoam tech. Seamless design coupled with MONO-SOCK tech is super comfortable and fitted. Forefoot and Rearfoot Gel Cushioning System protects joints from high-impact activities. Flytefoam technology has created one of the most responsive, lightweight, and durable shoes. AHAR Plus soles are super durable and long-lasting. Pickleball takes elements from tennis, badminton, and ping-pong to create a new, family-friendly game. In fact, it was designed by a family from Bainbridge Island, Washington, to keep the kids entertained and active in the summer heat. It quickly caught on around the island and has spread across the world since then. Now an estimated 2.5 million people are playing in the US alone! The game is played with a paddle, a plastic ball, and a net on a badminton-sized court, which ideally measures 20 feet by 44 feet, though this can be approximated or resized in a pinch. In fact, here’s a great guide to setting up a temporary pickleball court wherever you are and a diagram to help you visualize! Like tennis, badminton, and ping pong, pickleball is a game that involves volleying a ball back and forth over a net. The court includes a “Non-Volley Zone” which occupies the first seven feet on either side of the net, where the ball is not allowed to bounce and players cannot enter without faulting. This eliminates things like spikes and means you have to play with a different kind of strategy from other similar games. To start the game, one team serves the ball to the opposing team. The first time the ball enters either side of the court, the players have to let the ball bounce once before they can start volleying. Then the game really gets started! hits the ball into the non-volley zone, even just the line. hits the ball out of bounds. volleys a ball from the “non-volley zone”. volleys before the ball has bounced on either side first. If you need more help, we go into a bit more detail about how to play in our guide for choosing the best pickleball sets for beginners! A team wins when they reach 11 points with a two-point lead. If a team scores 11 points but their opponents have 10, then the game continues until a two-point lead is established. One of the reasons that pickleball has taken off in popularity (aside from its ease of set up and intuitive rules for anyone who’s ever played a volleying court sport) is that it’s a game that offers benefits to players old and young. 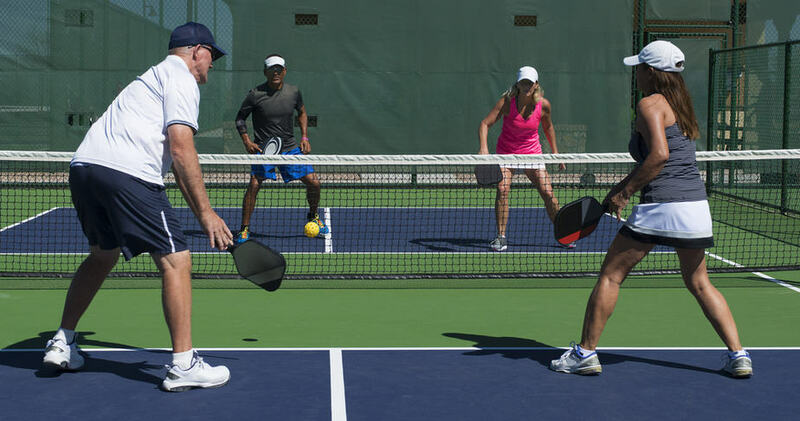 Pickleball is a great way to socialize, whether you’re playing with friends, family, or in a club or league setting. You can play one-on-one games or in teams of two, and the games can be as fast-paced as you want them to be. So, younger players can play all-out and older players can have a more leisurely game if they wish. It’s also a great workout. The movements of pickleball require you to work with all the different muscle groups of your body. Plus you get high-intensity interval training because the game requires bursts of more strenuous activity. It’s super healthy! This game is not just good for players who are young. Pickleball has been shown to have immense benefits for senior players, as well. On top of helping seniors to have a more active and fulfilling social life, the game provides a great source of moderate activity that can help keep older players healthy in a myriad of different ways. If you want to know more about playing pickleball as an older player and its health benefits, check out this link or this video about pickleball for seniors. Whether you’re playing more frequently on an indoor or outdoor court is an important factor to take into consideration when you’re deciding which shoes are the best for you, because you’ll have different needs. Indoor courts typically require non-marking soles so that you don’t leave skid marks on the flooring as you’re going in for your sweet shots. You’re also going to want something with more grip, as the floors can be more slippery than an outdoor court. Volleyball shoes, like the ASICS Gel-Rocket line, are a good option for indoor play because they’re designed to give you the best grip and stability, without leaving marks. For outdoor play, you want shoes that offer better support and more durable soles, as you’ll be playing on a much harder surface that can put more strain on your joints. The rough courts will also eat up your soles faster. In this case, especially since many outdoor pickleball courts are converted tennis courts, your best bet is going to be investing in a pair of tennis shoes. Plus, the movements performed in pickleball are very similar to tennis, so the shoes are designed to do what you’ll be doing. Court shoes tend to have a higher level of ankle support than running shoes, which supports the player as they make quick, omnidirectional movements. This is an especially important consideration if you have weaker ankles that roll more easily, but even as a person with sturdy ankles, it’s better to make sure your shoes provide strong support for your ankles, rather than risk injury on the court. This may not be the first thing you think about when buying shoes, but it can make a huge difference in your game in the long term. Investing in a pair of lightweight shoes can help you avoid fatigue and, if you’re playing all day, heavy shoes can begin to impact your play for the day. We recommend going with something lightweight and comfortable. It’s also useful to know that shoe weight does vary a little bit by size, so a larger sized shoe of the same brand and type will weigh a little bit more than a smaller one. Usually, the average shoe weight that you read online will be based on a size 8. Do you have a flat surface? Driveway? Backyard? Local park? Perfect! You can get a court set up in minutes just by stringing up a net and marking out the dimensions of the court in tape or chalk. It’s a super easy game to set up and start playing, which is certainly part of its wild appeal. You can refer to the links above if you’re having trouble figuring out the setup! If you don’t have a flat area or a net, that’s okay! Pickleball courts are popping up all over the place and it’s easy to find one to play on. A badminton or tennis court will do, too! Or you can check out the USAPA website for places to play near you. A great option is joining a local club or league so you can get to know other pickleball enthusiasts. You can become a part of this vibrant community and improve your skills by playing against other people! ASICS: ASICS leads the way in high-performance court footwear, showing up three times out of four on our list of the best pickleball shoes. Its name comes from a Latin phrase which means, “a sound mind in a sound body”, and all of their products strive to encourage that goal in their customers. K-Swiss: K-Swiss began in 1966 as a company making the first all-leather tennis shoes with an innovative design inspired by their ski boots. Their goal was to make tennis shoes that withstood and supported the aggressive side-to-side movements of tennis. They’ve been making high-quality court shoes ever since. Q: Where does pickleball get its name? Q: When was pickleball invented? A: Pickleball was invented in 1965 by a Washington State congressman, Joel Pritchard, and his friends and family. They built the first court in 1967, which still exists on Bainbridge Island. You can read more about the sport’s history here! Your shoes will have a noticeable effect on your play, and if you’ve been playing up until now with your old running shoes, you’ll be thrilled to discover the change in comfort and support once you’ve made the change to a pair of shoes designed for pickleball’s lateral movement and quick direction changes. Choosing your shoes really depends on what kind of play you’re going to be engaging in – indoor or outdoor – and this list gives you the best pickleball shoes for each kind of play, so you can go forward confident in your decision. Now that you’ve got your shoes, check out our guide on picking up a pickleball set so you have everything you need to get out there and play. Have fun!